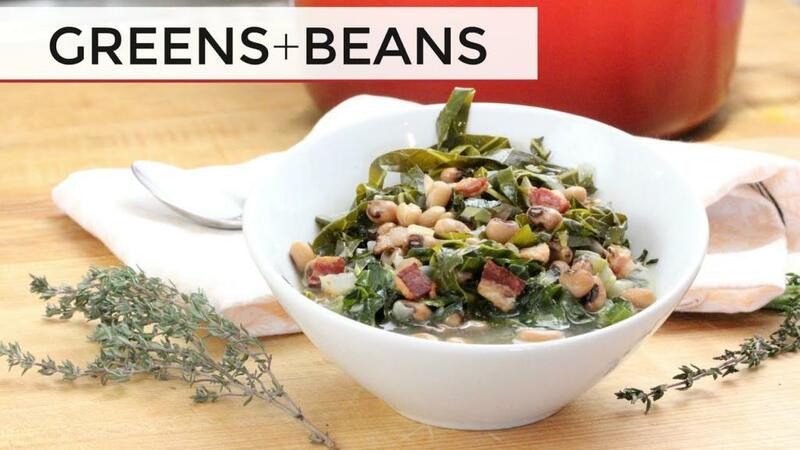 Collard Greens and Black Eyed Peas is the perfect meal to kick off the New Year. Jam Packed with delicious and nutritious flavors and ingredients, tradition promises that this meal will bring you lots of abundance in 2018. Heat olive oil in a medium stockpot over a medium low heat and then add bacon. Allow to cook for about five minutes or until the bacon is browned. Add in the onions and a pinch of salt, saute for about 3 minutes or until the onions begin to release some of their liquid before adding in the celery and garlic. Cook all the veggies for another five minutes or until they are fragrant and tender. Add beans, broth, thyme, and rosemary to the pot. Turn the heat to high and bring to a boil then reduce to a simmer. Once simmering, stir in your greens. Cook for another 10 or fifteen minutes (depending on how tender you like your greens). Stir in vinegar and season with salt and pepper. Enjoy!